It would not be spring without my making some kind of mention of newly hatched chicks. You can just see Mr and Mrs Duck toddling away from Lady Jane with four chicks (The ship in the background could be the Ventura, I'm not sure). They had obviously just hatched from the nest which was up against the fence. Apparently there were no less than eight eggs originally. Before this picture was taken I saw two of the ducklings in the water already, but they were abandoned to their fate. A little while later I saw the little chicks flutter/fall into the water after their mother. Sooo cute! 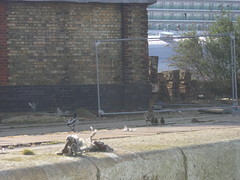 Right now, if you look carefully at the webcam you can see there are three gull chicks wandering around on top of the concrete block to the very left of the picture. It's all go around here in the springwatch department. 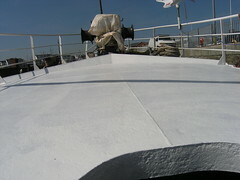 This is the last coat of primer for this part of the front deck. Next coat will be the very tough wearing Hempel non-skid paint. Once this is all done, I'll be in a position to move the windlass back into a better position. 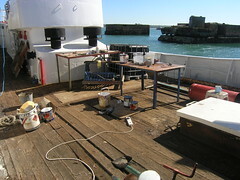 Next will be to make a start with rust busting and painting the forward section of this deck. BP kindly posted a video feed of their underwater 'issue'. It makes for pretty compulsive, though entirely pointless, watching. I thought it would be worthwhile to show the state of the deck while all this painting has been going on. The point is, almost inevitably, some mess is made while getting almost any job on Lady Jane done. Over the course of the last year or so, all manner of stuff has ended up being stacked against the edges I'm now trying to paint. All this stuff needs moving and/or tidying away. After a full day's painting, sorting all this stuff out is about the last thing I feel like doing. What perfect weather for painting. Finally I've got around to continuing where I left off on the port side rust busting/painting project. If I remember rightly, this had to be abandoned because the weather had turned so awful. I shouldn't be surprised at the difference a coat of paint makes, but I am. There is a long way to go, I know, but I can't help but feel quietly pleased with how Lady Jane is starting to look. I've experimented with a webcam on and off for some time now, but have not really spent any time on it. Seeing as it's so sunny and bright down here, I thought it would be a shame not to give it another go - at least while I was about and had the mains power available to run the PC. Maybe I'll see about adding a smaller version of it directly into this blog page somehow. I'm easily distracted by the activity going on around me the whole time. 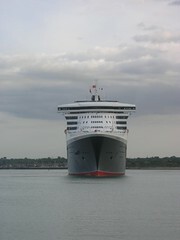 Saturday evening saw the departure of a whole series of cruise ships. Amongst them the Queen Mary 2, who did a neat 180 just behind me. What is interesting, is the modern cruise ships no longer seem to need a bevy of tugs around them as they manoeuvre in port. 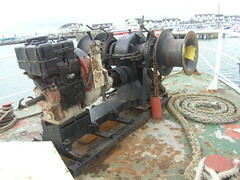 That will be on account of the Azimuth Thrusters they all wear nowadays. I forgot to mention, if you look carefully you can see two people standing outside of the hull, on the starboard side near the bow. Somewhat unsurprisingly, as soon as I get going with the painting, the weather changes. Not that I'm short of things to do when the weather is not great for painting, but it's a little frustrating to get interrupted once started. 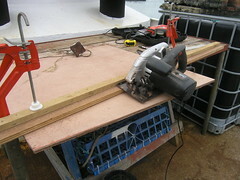 Anyway with things damp, but not raining, it's an opportunity to work on some of the backlog of woodwork I have to do. In this case a cover for the shower waste water container, which I should have made some time ago. Note the guide I made for the circular saw. It more or less guarantees quick but straight cuts pretty much every time. From time to time I get lazy and cut without the guide. Every time I do that I get reminded why it's worth the extra hassle of fetching and using the guide and clamps. 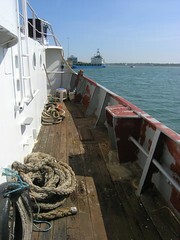 Work on the foredeck, ready for the windlass being moved back has started. The shiny red primer you see is the first coat of primer, in preparation for that all important non-skid paint. 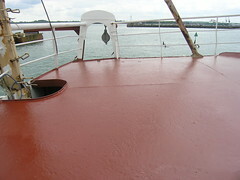 I've plenty of the Hemple non-skid paint on order, grey this time, as it was such a success on the back deck. This particular job is well overdue, as when that deck got wet it could be pretty treacherous. This one is just for Seb. One of the two pairs of bitts Seb made when he was last on Lady Jane. Next on the list here is to cleanup and properly paint the foredeck. I'll do this in two phases, the first phase being the part of the deck without the windlass. I'll then heave the windlass back into it's rightful position and finish up the forward part of the deck. Having non-skid paint on the deck, at last, will make things so much safer for all concerned. A picture of wires hanging out inevitably means Andy has been. These wires, and the accompanying mess, show the progress of putting 240V mains into both the galley and the steering room. At last. Actually, the wires you see are redundant wires in the process of being removed. Having mains power in the galley means toast from a toaster, rather than from the grill, first thing in the morning. As so often happens, it's the small things that make the biggest difference. This is a final word on the issues with the windlass - for now anyway. As a result of thinking through the process of raising the anchor last week, it became blindingly obvious that I had a clutch and not a gear lever on the side of the unit. Anyhow, I recently spent some time working on freeing up the seized clutch, by using a bit of big old rope firmly attached and brute force. I'm pleased to say the clutch now works reasonably well. I guess with use, this will free up even more. What I've discovered, probably because of the gearing, is that the windlass will not turn backwards no matter how much load is on it. This now seems a good thing. 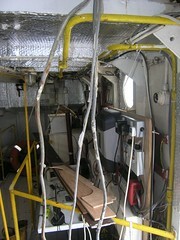 To get the windlass to reverse, I turned the shaft you can see at the front there using a big wrench. With this, it turns backwards easily. Now everything works according to plan, though I've decided to leave the anchor hanging on the brake, with the claw as a safety stop. It seems to me this is easier for quick deployment if needs be. Longer term, I'll weld up a crank handle to use on the front of the windlass. Problem solved - next will be to move the windlass back to a better position on the deck (see the angle of that anchor chain). I imagine if that was moored in the Solent, say just outside Cowes by the Bramble bank, there would be mayhem. I've had a lot of comment on yesterdays windlass post, so I thought I'd follow up on it and explain a little more. First of all there is all kinds of danger here, as anonymous pointed out, with the real risk of someone getting hurt as a result of a moment's inattention. As I've already discovered, that winch is capable of bending a manly sized shackle like it's made of cheese. Ensure the clutch is disengaged. Crank up the Lister engine. Engage the gypsy dogs using some clutch. Engage more clutch while releasing the brake. Haul in the anchor chain slightly using the clutch. Engage the brake, with the clutch slipping so the engine does not stall. Release the claw thingie when the weight is taken off it. Ensure its out of the way. Release the break and fully engage clutch. Use the accelerator if necessary. While hauling up on the chain, ensure the chain is flaked out in the chain box below to prevent deployment issues later. When the anchor is near its resting place, slow down proceedings using the accelerator and easing off the clutch. 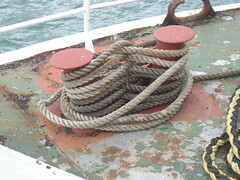 Ensure anchor is going into the hawse pipe the right way up, using the clutch to slow progress. With the anchor neatly in the hawse pipe, apply the brake well with the clutch slipping. After applying the brake, put the claw thingie onto the chain, to stop it running back out. Release the clutch completely, so the weight of the anchor is on the brake. 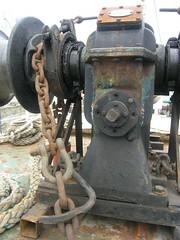 Slowly ease off the brake, so the chain feeds out slightly and the weight of the anchor is now on the claw. Release the gypsy dogs, so the warping drums or other anchor can be used. Shut down the Lister engine. Thinking this through, I see now that my issue is with a clutch that is not working. If this was working, I suspect the windlass would rotate under load when the clutch is disengaged. That's the theory anyway, I suspect this will take some careful practice. 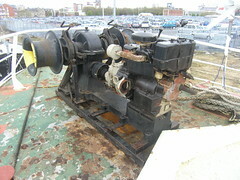 Here's the new windlass, in position on the upper deck. In reality, experience has shown that it's mounted too far forward and actually needs to be mounted on the part of deck behind the wave break you can just see in the picture. Most of the reason for mounting it there in the first place was that it just seemed to be the right place for it to go. My fault completely. Still, Seb had an idea I might change my mind and has just tacked it in place for now. Oh, one small problem I have with it is I can't get the windlass into neutral - it only goes one way. This means the anchor chain cannot get slackened off against it's brake, so as to release the gypsy dogs, meaning pulling the anchor up is easy, but letting it drop again is a small problem. I'm posting this because I've been asked, and because it's interesting (to some at least). Here's the ladder at low tide. It's a bit of a steep climb, but perfectly alright. What makes climbing the ladder at this state of the tide fun is if the wake from a big boat going by rolls Lady Jane some. You definitely get that 'going to tip over' feeling. 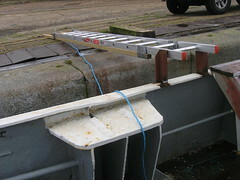 The ladder is normally stowed resting up against the wheelhouse roof when it's not in use, so it does not chafe needlessly. 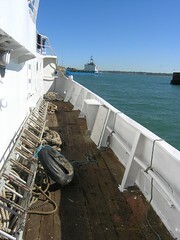 The blue rope you see is to retrieve the ladder from the quay. 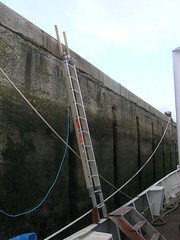 Here's the ladder at high tide. 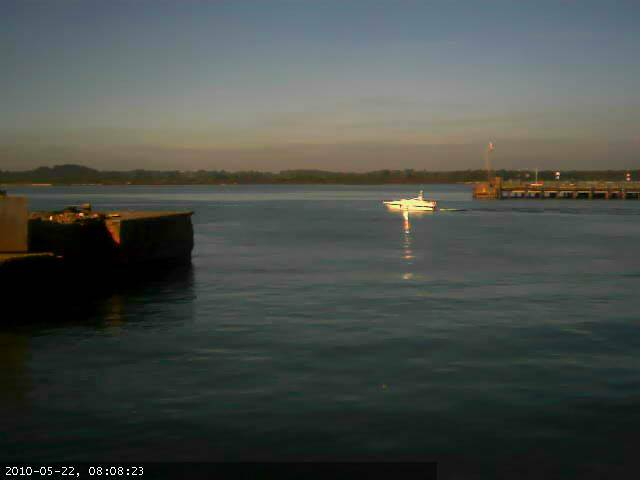 Lady Jane is floating close up to the quay wall in this picture. Oddly enough, I find negotiating the ladder at high tide the hardest, as I've not got the courage to walk across it and Lady Jane is often floating away from the quay side, making jumping across pretty 'interesting'. Oh, and before you ask, that ladder is 3.4m long (10 ft).